Just a quick post :) With Easter break and Ella, well, let's say my own time is limited. Health - well, not a lot else matters without good health, hey? Hairstyles - had quite a few in my life. Was never allowed long hair growing up. Mum's attitude was while she was paying for it it would be short and easy to handle. So since 16 it's been mostly shoulder length or longer - wonder at what age I'll rebel against that! Permed it once - never again! My hair is naturally wavy - and the perm made the curls go into overdrive - like I said, never again ;) It's been blond - red - black - all intentionally. It's also been orange once unintentionally! Plus of course, as well as being naturally blond as a baby, then slowly getting brown, I now have that tell tale ...grey!!!! History - love the subject, especially my own family history - royal family - hated learning about wars. I agree about the Health, we are nothing without it. hehe being a teenager in the 80's I totally know HAIR! OMG! Today the thought of hairspray makes me cringe! LOLz I prefer dying it dark reds though I'm 43 and I really want purple streaks to match my purple converse sneakers :D Seems my "Inner Diva" is breaking out! Thanks for sharing! Visiting from the UBC! Have a great week!! I love your theme for the UBC. We did a similar idea on our marriage blog (http://theromanticvineyard.com) where we did Alphabet Date Night ideas. It was so much fun to challenge myself with ideas for each letter. 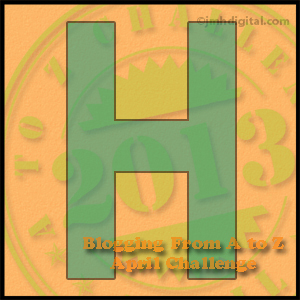 I love the letter H. History, Husband, Health, Heather (my daughter) and Happiness.